The older I get, the more I enjoy history, which is not all that uncommon from what I am learning. I have to admit that I am rather late to the party when it comes to visiting the many interesting and unique properties that are listed on the National Register of Historic Places. To date, I haven't made much of a dent in that list since since Pennsylvania alone is home to more than 3,000 such structures. Nevertheless however, I am always excited to set eyes on a property that makes it on the list. Learning the backstory from those who carefully present a case for preservation is intriguing as well. 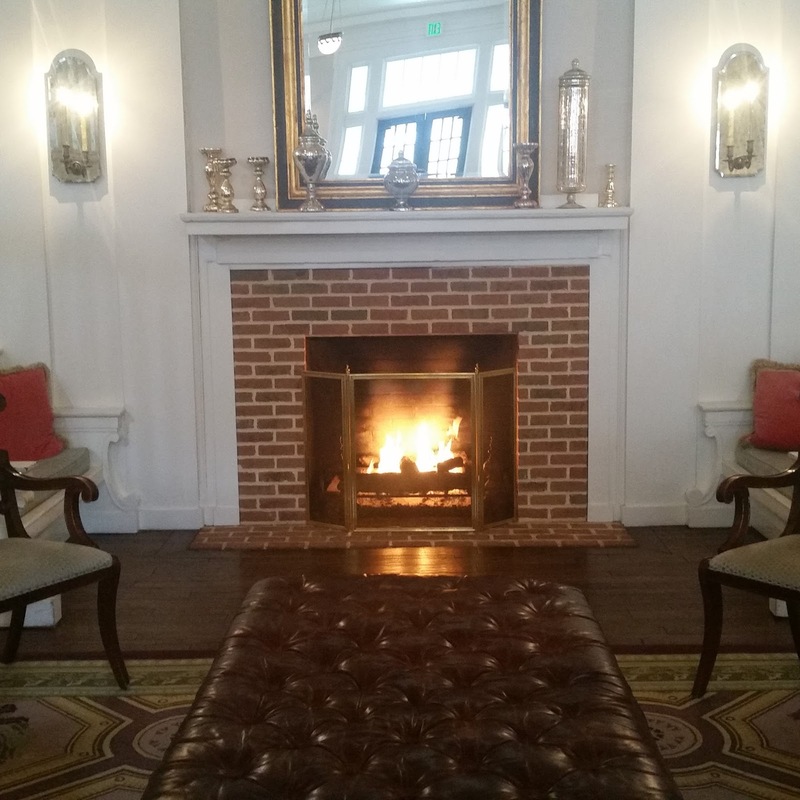 I visited the Omni Bedford Springs for the first time this Valentine's Day. Until then, I knew little about the property and its rich history, but soon learned more thanks to a knowledgeable guide who conducts group tours throughout the week. Omni Bedford Springs, view from the bridge. Located in the Allegheny Mountains of south Pennsylvania, the Omni Bedford Springs is home to eight mineral springs which, for centuries, were used by Native Americans for drinking and bathing. The water, with its rich mineral content, was said to contain curative properties, which eventually caught the attention of a local doctor by the name of John Anderson. In 1796, Anderson purchased the 2,200-acre property on which the resort now stands. Anderson began building bathing facilities for his patients and offered them custom prescriptions based on their individual health issues, while housing them in tents during their stay. As "taking the waters" grew in popularity, Anderson decided it was time to erect a structure to accommodate visitors. Aaron Burr, with grandson in tow, were among the first notable guests of the Bedford Springs Hotel. Many others would follow. In 1816, Attorney James Buchanan visited the Springs for the first time, followed by Thomas Jefferson, who suffered from acute rheumatism. By 1842, the resort had earned luxury status. Frequent guests included Presidents Andrew Jackson, William Henry Harrison, James K. Polk and Zachary Taylor. Other dignitaries included Daniel Webster, Henry Clay and John C. Calhoun. As the hotel gained a reputation as a retreat for the elite, it attracted top businessmen and industrialists, including such luminaries as Henry Ford and John Wanamaker, who maintained a suite on the first floor. Buchanan famously used the resort as his "Summer White House" from 1857-1861 and received the first transatlantic cable from England's Queen Victoria while staying at the Bedford Springs Hotel in the summer of 1858. The Bedford Springs Hotel also laid claim to other "firsts," including one of the first golf courses. Designed by Spencer Oldham in 1895, the course at Bedford Springs is one of the oldest in the United States. In 1905, the resort also installed the first spring-fed, Olympic-sized indoor pool in the nation. The hotel's heyday lasted approximately two decades--from 1900 through 1920. During the 1920s, its popularity began to wane as the country suffered the economic impact of The Great Depression, followed by World War II. In the mid-1940s, the hotel experienced an uptick in business thanks to the construction of the Pennsylvania Turnpike and the subsequent popularity of hotel tourism, which was fortuitously followed by a post-war economic stimulus. In 1984, the hotel was added to the National Register of Historic Places as one of the best remaining examples of "Springs Resort Architecture." Two years later the property ended what was a good run in the hospitality industry. This, of course, dismayed the citizens of Bedford, who held out little hope that their crown jewel would ever return. It wasn't until 2004 that the property would undergo a rebirth due to the efforts of a development company that specialized in historic renovation. The three-year, $120 million project was completed in 2007 and was purchased by Omni Hotels and Resorts in 2009. Today it stands as a mixture of old and new. To wit, a rare, 39-star United States flag dates back to 1865 and hangs behind the modern front desk. Historians may question the date so it's important to note that although only 36 states were in existence at the time, the creator, in a spate of optimism, added an additional three, making the acquisition a rare, one-of-a-kind specimen. 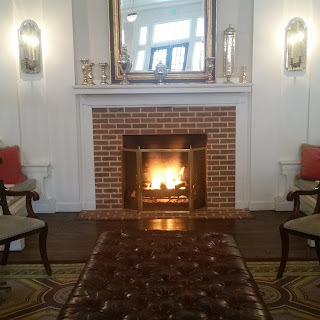 The lobby of the Omni Bedford Springs. Packing a bathing suit for a dip in the heated indoor pool is a must and guests who gaze upwards will see an elevated opera box where musicians once serenaded swimmers back in the days of yore. Those hankering for a little pampering will find plenty of opportunities at the 30,000 square foot "Springs Eternal Spa." The spa at the Omni is just one of just a few in the country to use natural spring water for treatments. The "menu" includes an array of services ranging from body scrubs, manicures, pedicures, massages, facials and even reiki. The popular destination is usually booked for weeks on end, so visitors are encouraged to call ahead. Staff recommends six-to-eight-week's advance notification. Products solds at the "Hope Springs Eternal" spa. For guests who enjoy the great outdoors, Omni offers a variety of activities like fly fishing, trap shooting, off-road vehicle tours, hiking trails, lawn games, horseback riding, tennis and segway tours beginning on April 1. The Omni Bedford Springs is known for its quality culinary program and many take advantage of the opportunity to watch chef demonstrations held at 11 a.m. and 3 p.m. on Friday and Saturday. During our stay, we enjoyed a delicious dinner of sea bass and steak in the formal Crystal Room where chandeliers are a focal point and pictures of guests from a bygone era adorn the walls. Sea bass over wild rice served in the Crystal Room. Steak with carrots over polenta and pesto served in the Crystal Room. A lovely Valentine's Day dessert served with a rum "injection." One afternoon we made it a point to grab a drink at the Frontier Tavern and settle into the oversized comfy chairs to enjoy the view overlooking the front of the property. Directly outside is a fire pit that is pulled into commission during warm summer evenings for toasting s'mores. Additional dining is available in the 1796 room named for the year when Dr. John Anderson purchased the property. Known for its USDA 21-day-aged prime beef and world-class wine list, the 1796 Room is a less formal alternative to the Crystal Room known for its historic atmosphere in an older part of the building. An antique stove is on display at the front of the Frontier Tavern. An antique tapestry hangs on the walls of the 1796 room. Our tour guide describing the 1796 room as one of the oldest rooms on the property. Shops line the hall of the first floor. An array of merchandise ranging from gifts, to books, logo items, clothing and accessories can be found in the shops that line the first floor. And since the Omni Bedford Springs is home to one of the top 100 golf courses in the nation, it stands to reason that they'd offer golfers the opportunity to choose from a variety of accessories and attire at the onsite pro shop. According to the tour guide, panes of glass were salvaged from the original property, so be sure to linger a bit in the "Duke of Bedford" library, where, if you look closely, you'll see names etched into the windows by various guests over the years. Called "the truing of the ring," newly married visitors would etch their names into the glass to test the authenticity of their diamond rings. Crossing the bridge to the springs. The Iron Springs and Wedding Grotto. Of the eight springs on the property, three are capped: the Sweet Spring, the Sulphur Spring and the Crystal Spring. The Sweet Spring was used by the early hotel for cooking and washing and is marked by a lion's head sculpture. The Sulphur Spring, formerly known as the Yellow Spring, was used to treat moderate bleeding, constipation and chronic diseases. The Crystal Spring, located south of the resort, was once compared to the "Carlsbad of Europe." Part of a mammoth was discovered nearby during an excavation. Non-capped springs include the Magnesia Spring, the Limestone Spring, the Black Spring, the Iron Spring and the Eternal Spring. The Magnesia Spring, located behind the wedding grotto, was demonstrated to have many curative properties and was used to treat liver disease, malaria and stomach and kidney disease. The Black Spring is said to contain the most potable water and is responsible for the irrigation of the golf course. The effervescent Iron Spring contains iron and common salts and was used for blood and bone disorders. The Eternal Spring was discovered beneath the hotel during the most recent renovation. It feeds the indoor pool and the on-site spa. Consult your concierge for directions to these natural wonders. One courtesy that the Omni generously offers non-guests is the opportunity to explore the springs on the property. Guests are also encouraged to take advantage of any scheduled tours and are welcome to visit the restaurants on site as well. After our stay at the Omni, we decided to explore Bedford's quaint downtown. One of our stops was at Bedford Candies. The small business located at 132 East Pitt Street has been making handmade, hand-dipped chocolates since 1929. The bright and cheery store was operated by the Sotirokos family for three generations before employee Tammy Wiley assumed ownership. She continues the daily tradition of making products onsite using old family recipes. Bedford Candies was founded in 1929. Another Bedford shop worthy of a visit is Founder's Crossing Artisan and Antique Merchant located on the corner of Juliana Street. The historic building was built in the 1890s in the Italianate style, originally serving as Oppenheimer's Clothing Store. Later it became home to a G. C. Murphy's--as evidenced by the stoop leading to the front entrance. Inside, you'll find an array of merchandise, from gifts, to home decor, crafts, antiques and collectibles. If you have some time to spare, you can easily wile away an hour inspecting all the unique items for sale. Founder's Crossing Artisan and Antique Merchant--look closely at the steps and you'll see evidence of the old G.C. Murphy's. Founder's Crossing offers two floors of crafts, antiques and sundries. 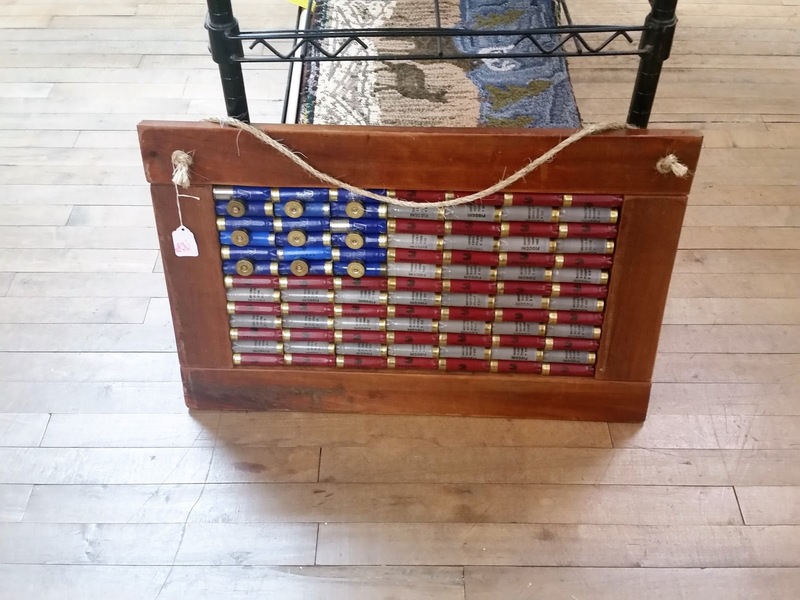 This shotgun shell flag gave me a chuckle. I would have loved to have taken the free guided walking tour of Bedford, but it was too early in the year when we visited. Tours last 90 minutes and are conducted every Friday at 3:30 p.m.. starting in June. As we poked around the town, I snapped a picture of this attractive house and later learned that it was owned by Dr. John Anderson--the individual mentioned earlier who was responsible for founding the resort in Bedford Springs. Built in 1815, it is characteristic of the Federalist style. Federalist homes often featured American symbols and Dr. Anderson's house was no exception. If you look closely at the front door, you'll get a glimpse of American eagle partially obscured by the wrought iron railing. Before we left the area, we ducked into another Anderson building. The Golden Eagle Inn was built in 1794 and was known as The Anderson Mansion. It is listed on the National Register of Historic Places and is known as one of the oldest buildings downtown.We enjoyed a wonderful lunch at the downstairs pub before proceeding home. In retrospect, I wish I had ventured upstairs to take a few shots of the interior of the old hotel. Unfortunately all I can share here is a not-so-stellar picture of the outside and the downstairs pub, but if you follow the link, you can get a little better idea of what lies beyond. The front of the Golden Eagle Inn, once known as the Anderson Mansion. We enjoyed a delicious lunch of Korean chicken and a Reuben at the pub downstairs. When we wrapped up our short visit, I was fairly confident that we had seen much of what Bedford had to offer, although I wouldn't mind returning to the interior of the Golden Eagle Inn and taking the walking tour I mentioned. If you're looking for a unique way to spend a long weekend, Bedford offers much to explore.